Founded in 1835, Oglethorpe University is home to over 1100 students, representing 33 countries. Located in Atlanta, Georgia, the university offers a wide-ranging curriculum that demands a flexible campus to meet the learning needs of students. With a strong focus on fostering an intellectual and well-rounded community, collaboration and academic engagement rank high amongst Oglethorpe’s priorities. With sights on a new campus building, Oglethorpe University leased six temporary pilot classrooms in a private residence hall, located across the street from its main campus. These six classrooms are part of a project designed to inform the university of possible learning space configurations for their new building. The architecture and interior design firm RJT + R, in partnership with Jeanne Narum, principal of Learning Spaces Collaboratory, recommended Knoll products for their exceptional aesthetics and high quality finish, as well as the company’s experience and focus on creating flexible workspaces that encourage collaboration. Tailoring a solution to meet the university’s goals, Knoll dealer Corporate Environments presented a space that prioritized both flexibility and collaboration. The new classrooms not only offer different seating arrangements for students, but also facilitate the reconfiguration of space according to various university teaching styles. Bright colors and soft materials, specifically with Knoll k.™ lounge seating and side chairs, are used to create an inviting learning environment. In an effort to configure a variety of classrooms in order to get robust feedback for future planning, the team installed a range of Knoll table products. Pixel™ C-Leg Tables with casters allow one room to be configured for either discussion-based, lecture-based, or activity-based learning. In other classrooms, Dividends Horizon® X Base Tables with marker board tops encourage the impromptu sharing of ideas. To further enhance flexibility, Toboggan® Pull Up Tables offer easy access to an extra worksurface in addition to providing a perch. Dividends Horizon X Base Tables have been paired with black and yellow k. lounge seating, where circular benches and ottomans simultaneously promote the school colors and provide a relaxed, alternate place to socialize or break out into study groups. The bright palette continues with red Gigi Side Chairs that echo the frames of the Toboggan Pull Up Tables. Students have reported that the colorful furniture makes them feel better in the classroom, and ultimately more comfortable in the space. In addition, the color schemes across classrooms help diversify each space, preventing them from appearing monotonous. Oglethorpe University’s Provost and Vice President for Academic Affairs, Glenn Sharfman, has noted that a more robust Wi-Fi network has allowed faculty to be more creative with their teaching styles. Knoll Power Cubes have been installed in the classrooms, facilitating the use of mobile devices. Power Cube can also serve as an extra worksurface for breakout meetings or activities. The versatility of design across the six classrooms at Oglethorpe University leads to a series of spaces that are both practical and inviting. 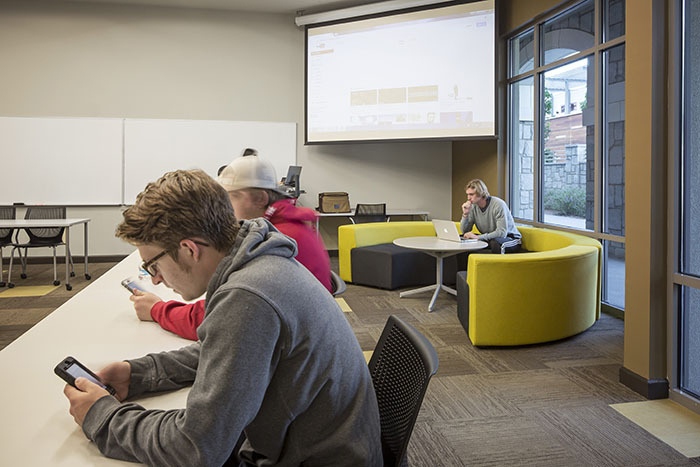 From colorful k. lounge seating to easily configured Pixel C-Leg tables, this project facilitates reconfiguration, encouraging faculty and students to create custom spaces that promote classroom learning. By providing needed flexibility and choice with a range of technology and furniture from Knoll, not only has Oglethorpe engaged in an experiment that has yielded strong results for future planning, but has also demonstrated to their own faculty and students that a less rigid classroom structure can effectively bolster student engagement.